The fatty acid composition of a fat or oil is most commonly assessed by gas chromatography, following conversion of the fatty acids methyl esters. 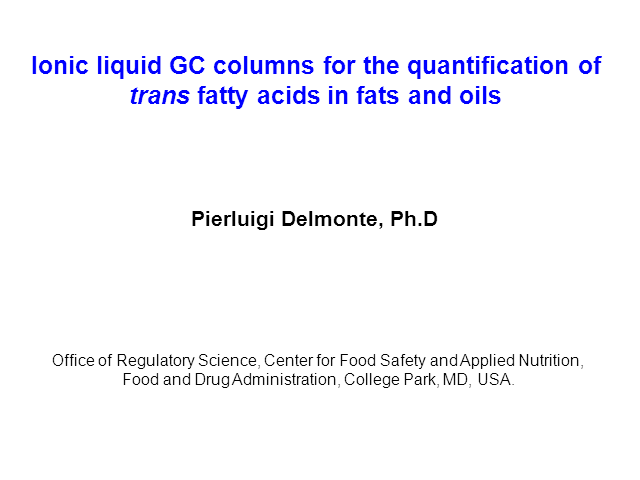 The current most refined analytical methods for the quantitation of trans fatty acids rely on the separations provided by long cyanopropyl siloxane capillary columns. The introduction of capillary columns coated with ionic liquids, such as Supelco SLB-IL111, provide an alternative separation tool characterized by a higher stationary phase polarity and selectivity toward geometric and positional isomers of unsaturated fatty acids. The use of these novel capillary columns can provide more refined separations of complex lipid samples. As a result, most conjugated linoleic acid isomers (including t7,c9- and c9,t11-18:1 FA) can be quantitated in a single separation using a 100 m SLB-IL111 capillary column and most 18:1 FA positional and geometric isomers can be separated using a 200 m SLB-IL111. Ionic liquid columns provide more detailed FA profiles, especially for unsaturated fatty acid positional/geometric isomers.